e best value for an Italian made steam cleaner in this category. No one can beat what is under the hood or included at this price! Complete challenging cleaning tasks that end with a finished project that is cleaner than clean with no chemicals and no leftover residues. The performance is as good if not better than many machines sold at 3 times the price. Featuring a pressure gauge, full range adjustable pressure regulation, stainless steel boiler and detachable hose operating at 65psi and a 298 degree boiler temperature. Exclusively manufactured in Italy for Vapor Clean® and direct to our warehouses and ready to ship! Vapor steam cleaners are particularly effective on almost every hard surface in your home, tile in bathrooms and kitchens, “sealed” hardwood floors, kitchen counter tops, sinks, oven tops, caked dirt. Mold and food spills in and on refrigerators, upholstery, wrinkled clothes, dirty walls, wallpaper, cleaning windows and screens, automobile interiors and tires, ovens, defrosting refrigerators and on. Our staff is ready for questions with answers should you need any help with the use of your machine. Click on any of the provided tabs to find everything you need to know about the Vapor Clean II steam cleaner. 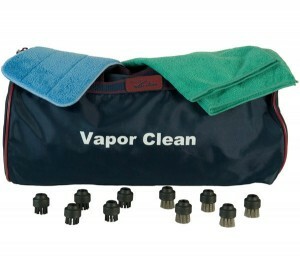 Check out our accessories tab to see some of our specials offered today and unique items for your steam cleaner. Our buyers favorites include our classic Bonus Pack which is a $60 value offered at the time of purchase. This great deal includes $42.00 worth of cleaning brushes, carry bag, microfiber towel and mop pad. From microfiber mop pads, towels, steam intensifier pads, we have an arsenal for your cleaning job. When cleaning, can I pull it around by the hose or could it tip over by doing so? Yes, you can pull it easily by the hose. In fact the design of the flap with a small pin that snaps into the hose ensures that you are well attached and ready to go. The design is extremely stable as all of our machines, the 2 large wheels and 1 full rotating small front wheel under the machine allow full mobility. Below you will find information about out products and policies. The links will open in new windows, so you can stay on this product. If your machine is not functioning properly, please call the Vapor Clean helpline at 1-800-758-3141 or submit a service request. Many issues can be rectified over the telephone or via email with our trained customer care staff. Before service can take place, the terms of the warranty require that you complete and submit a request for service. What is covered: Your Vapor Clean machine is warranted under against original defect in material and workmanship for the duration of the warranty period excluding accessories, attachments and normal wear parts when used in accordance with operating instructions under normal and reasonable use. This warranty provides at no extra cost to you, all labor and parts to place your product in proper operating condition for a period of one year from date of purchase to the original purchaser.